The weather looked decidedly unpromising as our Captain repositioned the ship from George Island back along Icy Strait and into another sheltered cove where Fox Creek enters the sea. Fortunately, as everyone prepared for the afternoon on shore, the clouds lifted. This was another rocky shoreline. It’s amazing the places plants find enough nutrients to grow. This elegant grass known as Dune Grass or Dune Wild Rye; Elymus mollis, is a native grass that only grows in coastal areas. It’s hardy with strong, erect stems up to 30cm (1ft) long which have been used by native peoples to make twine and bindings . A close up of the inflorescence of the Dune grass show it to be very soft and hairy. This grass is not native to Alaska. It’s a European beach grass which is gradually dominating the coastal areas that were once the domain of the native Dune Grass, Elymus mollis. Heavy skies but the crew goes ahead to prepare the kayaks. Note the rocky beach; not easy walking. The kayakers prepare for a paddle in this sheltered bay. There’ll be no DIB exploring today. The Beach Groundsel or Seaside Ragwort; Senecio pseudo-arnica, is a daisy… yet another member of the large Aster family. It’s stout stem is surrounded by luxuriant foliage of fleshy, large, oval leaves which are green above & fuzzy white below. We were just too early in the season to see these Senecio pseudo-arnica flower heads burst open with bright yellow rays surrounding a darker yellow disc of flowers. These daisies are not native to Alaska; they’re abundant along the shores of the eastern and western Pacific and the western Atlantic. The common name of Groundsel seems to be derived from an Old English word grundeswylige which meant ground swallower! And, yes, it often becomes a weed. Beach Greens or Seabeach Sandwort; Honckenya peploides, is a low growing plant that is found on gravelly beaches near the high tide line. It can even survive being covered by sea water during an especially high tide. It’s densely covered with fleshy, pointed leaves. The flower petals are spatula shaped, shorter than the prominent green sepals. It’s always pleasant to just wander along a beach to see what can be found. Mertensia maritima, is, as its species name suggests, a plant of the seashore. It has a circumpolar range on the northern beaches of the British Isles, Scandinavia, Greenland, and northern North America. It’s an attractive perennial herbaceous plant with a long spirally-twisted taproot that anchors the plant to the gravelly beach. One common name, Sea Bluebell, refers to the lovely blue bell like flowers. The clusters of flowers begin as pink buds before turning blue. Another common name is Oyster Plant. This name refers to the silvery blue-green, thick, oval leaves which, some say, taste of oysters. A shower of rain just added extra beauty to this Sea Bluebell flower. The Beach Pea, Lathyrus japonica is also known as Lathyrus maritimus. It’s a lovely climbing or trailing plant that grows over other plants along the edges of gravelly beaches. Flower buds are deep reddish purple gradually turning to a deeper purple. Fully opened flowers of Lathyrus japonica, have intricately veined petals. Beach Pea is native to temperate parts of Europe, Asia, North and South America. They ‘travel’ far and wide! The seeds, housed in long pods, have the amazing ability to remain viable while floating in the ocean for up to five years. Where-ever they wash ashore, the seeds germinate when the hard outer seed coat is bruised and opened by wave action on sand and gravel. Another world wide ‘traveller’ is the Creeping Buttercup; Ranunculus repens. Unalaska Paintbrush; Castilleja unalaschensis, is similar to the red paintbrush we saw earlier at Pond Island, except it has yellow rather than red bracts surrounding the flowers. The lovely White Bog Orchids; Platanthera dilatata, are probably the easiest orchids to identify because of their pure white flowers and sweet perfume. David found these on every walk here in the Tongass National Forest area. Yes, they might be common; but they are beautiful. This one had a very tall stem that did not fit into the photo. In the right conditions, the stems of these plants can be a meter in length with up to 100 flowers per stem. Bog Orchids have been seen in their thousands in marshy spots beside roads and in forests in mountainous areas of the Pacific Northwest. What a sight that would be! Fritillaria camschatcensis, as its species name suggests, is native of the Russian Kamchatkan Peninsular, just across the sea from Alaska. This lily looks lovely but it has a really bad smell which it uses that to attract flies as pollinators. 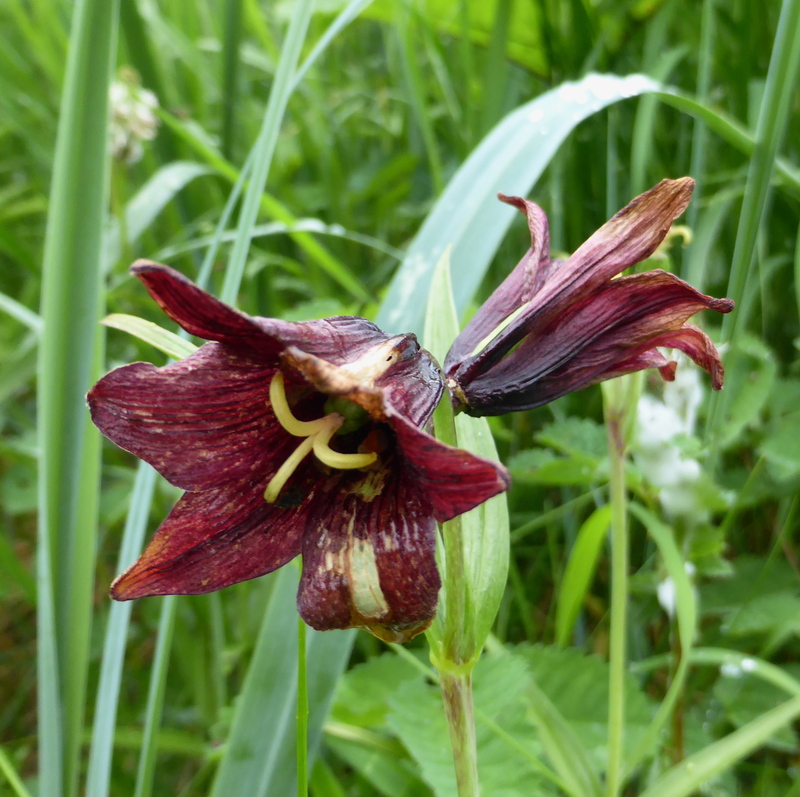 It has at least four common names; Black Lily or Chocolate Lily for the colour of its flowers. Indian Rice or Eskimo Potato are a little more obscure. They refer to the way native people used the plant’s clusters of tiny white bulbs which resemble rice and were used in much the same way as rice in times past. Now rice is plentiful in shops and the art of harvesting and cooking the lily roots has all but disappeared. Close up of the lily flower of Fritillaria camschatcensis. a forest that is a well known feeding place for grizzly bears. Whether they came across a bear or not will have to wait until the next post.